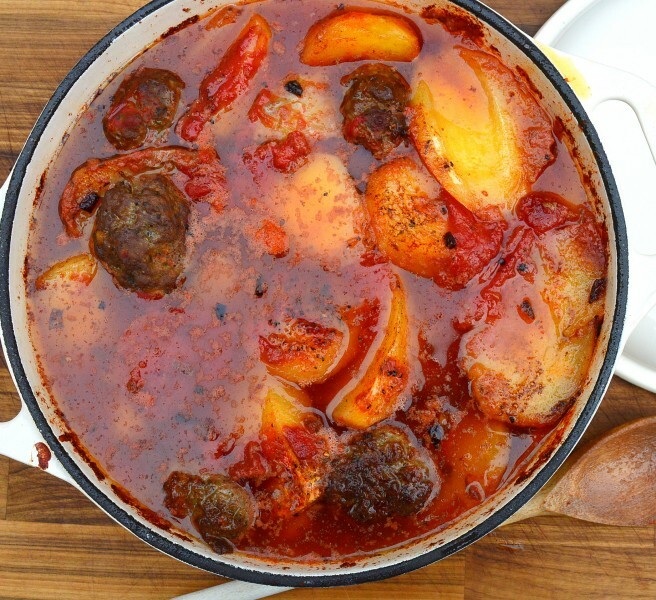 This meal is such a fantastic winter warmer that is a favourite in our house. The patates yahni (potatoes baked in tomatoes) can be made alone, turning this dish into a delicious vegetarian meal or a great recipe to whip up when time and money is low. The keftedes add extra substance to the dish and it doesn’t matter how many of these I throw in, it never seems to be enough for our lot! The keftedes can be prepared and shaped the night before and left in the fridge overnight. If you slice and soak the potatoes you can throw the lot together in ten minutes the next morning, then put on a low heat in the oven to cook throughout the day. The longer the cooking period, the sweeter the tomatoes will become and the better the brand of tomatoes, the better the flavour of the dish. If time is of the essence and you don’t get around to preparing it til later in the day it’s no problem at all – just bake it at a higher temperature for an hour and a half or so instead. If you are making this dish to eat in a couple of hours time preheat the oven to 180°C/350°F/Gas Mark 4. If you are preparing the keftedes and soaking the potatoes to sit overnight in order to slow cook throughout the following day, you’ll need to put them in at 150°C/300°F/Gas Mark 2 the following morning and allow to cook for at least 6 hours. Peel the potatoes and cut into slices approximately 1 – 1½cm thick. Place in a bowl of cold salted water and set aside. For the keftedes, finely chop the onion and crush two cloves of garlic. Place in a bowl with the minced meat. Add parsley, oregano, pudding rice, salt, pepper and egg. Use your hands to squish all the ingredients together adding the olive oil a little at a time as you go. You will need to bring the mixture together for a good few minutes until the meat becomes softer and pliable. Once you notice a change in the texture of the meat, roll into balls slightly larger than a golf ball and pat down lightly. Place in the fridge to chill for 30 minutes or overnight if not cooking them until the following day. When you are ready to begin cooking them, put a glug or two of olive oil on to heat in the bottom of a heavy based oven-proof dish. Place it on the hob over a medium heat and once it has warmed up well lightly brown each side of the keftedes. Remember, you’re only browning them, you don’t need to cook them through. This will ensure they don’t fall apart once cooking in the oven. Once browned, set them to one side. Add another chopped onion and two crushed cloves of garlic to the bottom of the dish with the remains of the olive oil. Cook until softened. Once the garlic and onion have been softened remove the dish from the heat. Drain the potatoes and layer up slices of potatoes and keftedes until the dish is full. Add a can of Cirio Chopped Plum Tomatoes (you can also use Cirio Plum Tomatoes and squish them with your hands instead. It won’t make a difference to the flavour and is just your own preference). Add enough boiling water to completely cover the ingredients in the dish. Place the lid on top and put in the oven to cook for the required time: approximately an hour and a half at 180°C/350°F/Gas Mark 4 or, if putting it in the oven to cook throughout the day, 150°C/300°F/Gas Mark 2 for at least six hours. The meal is ready when the potatoes are completely softened and tender and can be poked through with a knife or fork easily.